The following will probably be received as a controversial statement, but most of the contents in Gan Jue I can perform "naturally", in other words, I use no "methods" to achieve the desired results. Believing me will make no difference, the truth is you can too if you just do it, sense it, feel it, believe it, get into it, give it a go. For the rest of you there are methods, sort of, you'll see what I mean as you read through this manuscript. Thank you for your interest. A Touch of Healing (previously titled "A Touch of the Hands" and feature in "Scryer and Friends" featured here with additional notes) This method of energy transference has given me a tremendous amount of mileage. I've used it to send out a long distance healing touch that the receiver actually feels. I'm primarily an entertainer, but I'm also involved in the metaphysical world and perform energy work for real from time to time. As a Reiki Master and Qigong practitioner and instructor, distance healing and energy transference is not something that is foreign to me. Some of you may be wondering why I changed the name of this presentation from "Touch of the Hands" to "A Touch of Healing"? I did it because I realized I had never "performed" this without sending out Healing Energy and attempting to spread Love and Light in the process. The name change will hopefully influence you to do the same rather than just a showoff demonstration of your ability to send out energy. Psychic Detective Technique - I have published this before, years ago, and it has been off the market for a long time, but it is something I still demonstrate today. Basically it's the simple example of what a Psychic does while working with law enforcement. In this case, using three business or index cards and three participants, you will be able to keep accurate track of an "illegal transaction". It's an easy, quick, routine requiring little effort on your part, but effective. The Casual Object Reading Demonstration - This demonstration of Psychometry Abilities has also been released before and it's here again (with additional notes) because I still use it and it's a strong piece of psychometry demonstration using just ten regular playing cards. Borrow a deck and you're set! HHT - This is just a bit of casual Psychic fun using some coins while out for a meal with a friend or on the train with an available surface. It won't work every time but it shouldn't really matter, sometimes you'll get a near hit or maybe you're that night, no big deal. This is something you should present casually, in the spur of the moment, as if the feeling/thought had just occurred to you. You write something on a piece of paper, believe it will happen, then allow your subject to throw some coins down. S.M.P.C.V. - A potentially very strong Psychic Demonstration using playing cards WITHOUT HAVING TO USE AN ACTUAL DECK. Allow a playing card to come to you intuitively. Write it down on a card. Ask your participant to think of any playing card at all and have them tell you what it is. You'll reveal a direct hit or a damn near hit! No nail-writing, no switches, nothing of the sort. You will show the subject what you wrote down and they should be considerably impressed. The variation of an unusual method! The Oracle Deck - I struggled to release this subtle secret. Protect it! 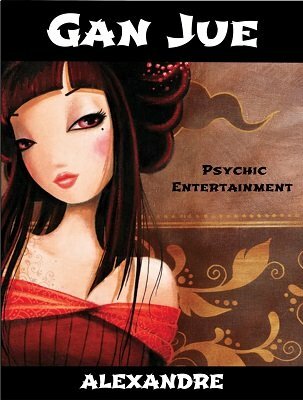 You will be ale to demonstrate you Energy Sensing abilities (and other things) using a very popular Oracle Deck within the metaphysical community (deck can be borrowed!). A demonstration where you'll be able to sense and remove an energetic disruption using a few cards from this famous deck. Use your hands or you can even use a pendulum if you like. This is a very effective demonstration and one I've done (for real) exclusively in metaphysical stores and metaphysical events. After reading this, you will be able to do it, too! With a little creativity, you'll be able to do EVEN MORE! An manifesting exercise with a regular deck of playing cards you should be doing all the time AND trying it out with your subjects! Another exercise, this one based on mathematical probability, but still impressive! As "old as the hills" but MUST BE PRESENTED AS REAL! I also discuss using this with groups, something I did successfully while performing for President Carter and family a couple of years back in the Florida Keys. Energy Field Perception Readings! I tip an idea I use on a daily basis to great effect, and refrain from going into too many details, if you already know a reading system, this will be a very nice something you will be doing ALL THE TIME, ANYWHERE, EVERYWHERE!